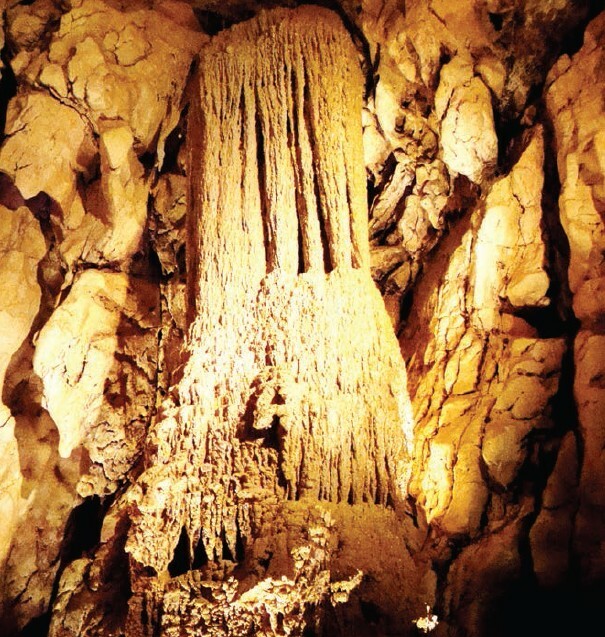 A popular day-trip destination in the Jura Mountains on the Swiss-French border, Vallorbe Caves boasts of magnificent stalagmites, stalactites, fistulas, and the Orbe underground river. Vallorbe is a ‘once upon a time’ story that transports you to a world that existed under the Sea, 150 million years ago! Rocks kept on forming by marine sedimentation and they say the strata at Vallorbe built up to 200m depth of cave limestone in less than 10 mn years. A geologists delight, this process continued for 120 mn years and minerals like limestone, calciferous clays, sandstones, conglomerates, etc. were deposited, layer upon layer. All this kept on happening under sea and it was only about seven million years ago that the sea withdrew after an upheaval of continental plates forced by unimaginable tectonic activity. It was hard to believe that one stood at a site, which was created by the collision of the African and European continental plates. ‘Inner spaces’, which today are known as Vallorbe, were created in that great moment of ‘birth’. Perhaps, when the sea receded, dinosaurs roamed that area, laid huge eggs, and hunted other living beings. Some kind of pre-historic feeling was being conveyed to me by the force of nature, so powerfully felt at Vallorbe. A stream ran beside the uphill path I took for the mouth of the cave. Frankly, I was not expecting to see more than one long cave. It was cold inside. The kind of cold wind that flows after touching the snow! 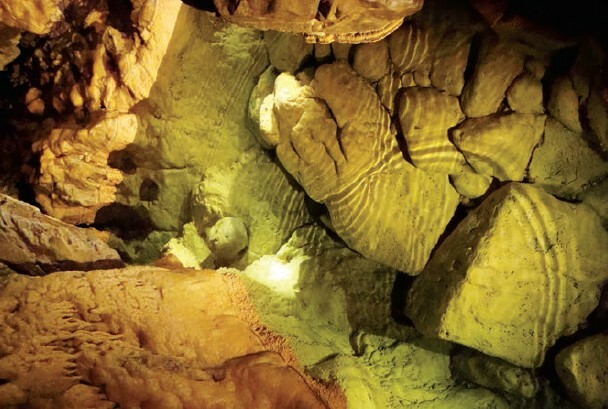 The cave complex was dark and the natural formations lighted up only when sensors were activated by human presence. In a way my human steps became a magic wand lighting up wonder after wonder as I advanced. A pool of water here and then a chamber full of surprising shapes. The stalactites and stalagmites have been fed by Nature, a mixture of minerals and water droplets, under cold conditions. So, many different shapes have been formed at Vallorbe and one can find proximity to a ‘shape’ using one’s imaginative faculties. It seemed to me that this was the habitat of mermaids when it was under water. There were niches; those looked like resting chambers, and small caves opening from a larger cave. Caves at different levels gave the impression of a well defined complex, where mermaids lived in highly organized hierarchy. At one cave, there were so many lingam shapes to delight a Shiva devotee from India. Three in a row, more placed at different levels, some thin and tall, some fat and stocky. At one place I got the impression of Pilgrims Progress, another time of a Conference of Elders. One charming shape was of a huge natural chandelier decorating a large cave. I stood before another and thought it was a beehive, yet another the human brain! Suddenly, light beamed from the gap visible on the wall of one cave and this revealed a bridging platform, leading to another cave chamber. On top of this cave was pasted a long frill like shape, often used for curtain decoration. Was it the Sword of Damocles that hung in front of me? I did not have the courage to go under it and discover lest it fall on my head. As I found my footsteps before another wonder, the sensors would light it up before it fell dark again. I had by then trained my impulse of using the camera before the ‘revelations’ fell back into darkness. I must have excitedly taken scores of photographs and still the hunger was not satiated. The shapes had been formed so intricately that it could shame a Master Craftsman. So much detail had gone into the handiwork that the effect was nothing short of miraculous. And to know that such workmanship was untouched by human hand was unbelievable. It only proved a point that nature is the most powerful, most knowledgeable, most perfect craftsman.With what beauty, with what colour, with what softness and ornamentation, nature creates is amazing! This ‘creation’, is unequalled and unparalleled to any human effort, howsoever gifted, talented or trained that might be. It was difficult to remove oneself from this star-studded presentation from nature’s lap. Yet, one has to move, as that is also a law of nature. I felt a yearning in those shapes to tell their story. These inner spaces had seen more life than any other to recall and been witness to the evolution of life. Occasionally a cold drop would fall and moisten the surface it fell upon. Each falling droplet is like a blessing here, which takes some shape as it freezes in its fall. I was also conscious of the fragility of these shapes. Any change in weather or wind pressure could alter them to assume another shape. So what I saw, only I saw, perhaps that shape does not exist anymore. Perhaps, in its place hangs or stands another shape to amuse, please or deify in wonderment. As I looked at the watch, it reminded me that my time in this Fairies Grotto was up. I moved towards the exit. We were almost taking a u-bend. 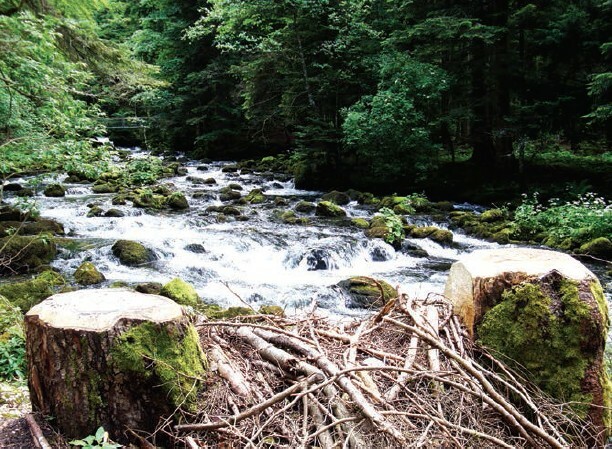 Then suddenly, there was this startling sound of gushing water. Down, far below, was a source of water, which was gushing out from the belly of the Earth in such force that it had created huge balls of froth. 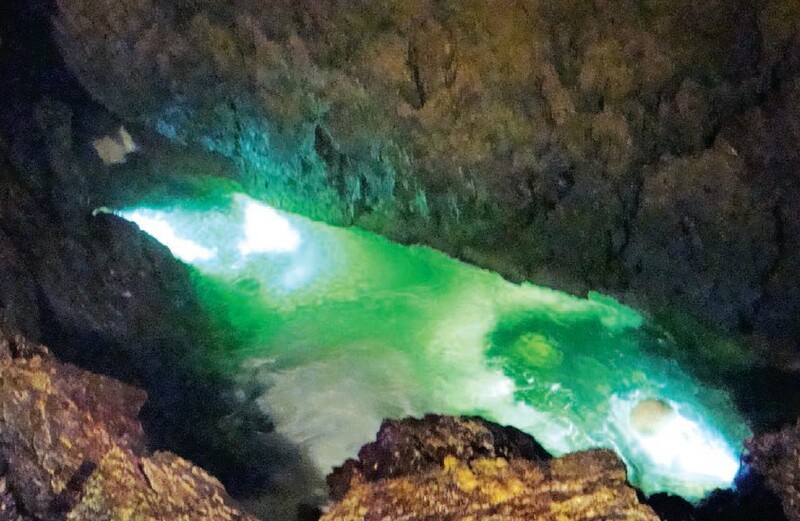 These are the underground waters of the Orbe, breaking out on Earth in this little town of Jura. Many divers, beginning from Pfund in 1893 have tried to explore the underground stream. They have only discovered more underwater chambers with immense water. Magnificent photographs have surfaced as divers did a reconnaissance of the Lac du Silence.